Congratulations on the clear but wouldn't it be better to quote a specific part rather than the whole list? Very nice 2b, yet again congratulations. I wonder if you're gonna aim for 2.5b someday? Thank you, and indeed I am. I think now ill get TD & MoF lunatic, this should be fun. MoF LNN! After 7 soul crushing VoWG failures! Aaaaahh it feels so good! Very nice; yet another LNN! Congratulations! 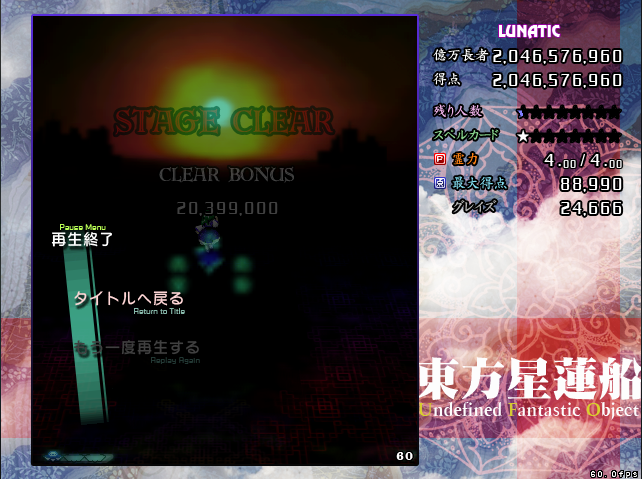 It's been a while since I've done anything particularly noteworthy, but after getting the Touhou pangs today I decided to do a full run of Imperishable Night, and against all odds I pulled off my first no death run of any lunatic! There were some silly moments - such as bombing and then death bombing on Kaguya's Brilliant Dragon Bullet - but overall I'm amazed how this turned out. Whoa, nice. 30 spells captured, too! Have you ever gotten LNB? You should go for it! I eeked out a no bombs run of IN some years back, but I don't imagine it likely I'll ever be combining the two. 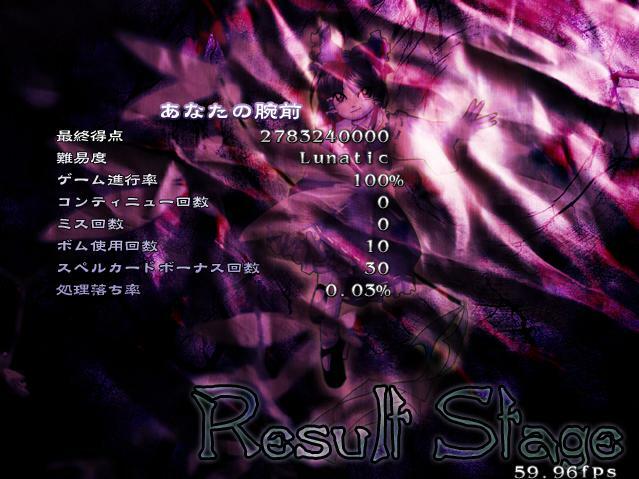 ;^^ I was just amazed I managed to play this well, since I've been in kind of a Touhou slump the past months. Sure, I can post the replay. If I knew how to contact Len I would be badgering them to remake the game for a NEW GENERATION. With less Nue. Until then, how "temporary" is the mirror on the wiki page, and should I use that? The mirror is broken (it went down when Bitcasa shut down their personal service, and I haven't decided whether I want to replace it yet). Thanks for the replay, it's an impressive piece of work. There is a place that seems to have a mirror of it but Respectable People probably don't want me linking there. Guess I'll go back to EoSD Extra stage NMNB and Mystic Square Extra Stage scoring attempts now. Hey all. Anyone still remember me? Probably not lol, I haven't posted on here in literally years. Going to at least try to stick around for a while. I just cleared PCB Phantasm at 120 FPS, it was exhilarating af, and reminded me of why I used to play Touhou more. - Cleared all scenes in Shoot the Bullet at 90 FPS. This was ages ago, most of the better videos are still on my Youtube channel. Here's BoWaP for a sample. - Way too many miscellaneous Lunatic/Extra timeouts to name. I'm lazy. So yeah...hoping to catch up on what I've missed. I heard there's a Touhou 15 now or something? Congrats on going all the way! I've tried this before and only made it to the first phase of her second survival. Have you tried UFO no-vert too? I've attempted that as well and it seems like it may be possible, my best run got all the way to 6 seconds left of Undefined Darkness. You might be better for this challenge than me haha. Welcome back! And I'm sure some people remember you (at least if they notice the "Nickname: Malky")... Though I'm not sure how many of us who were active years ago still play Touhou that often. I hope you enjoy LoLK. Pointdevice mode is... different. Might be a good game for you if you ever return to your old habit of random timeouts. It's already 2 years I've been playing Touhou and enjoying a lot these games, even if recently I can't because of hardware *cough* constant 30 fps on Linux *cough* problem. Beginning: approx. 15/07/2014, Session counter: approx. 60 sessions. Easy: 1cc Cleared with Reimu B (26/10/2014), score: 58554740 (58.55M), actual high score: 58554740 (58.55M) (the first and last easy mode game ). Normal: 1cc Cleared with Reimu A and 5 lives (06/09/2015), score: , actual high score: 81.74M (Reimu A) (or slightly more? don't know). Hard: played but no precise data. Lunatic: hehe, played but no precise data. Beginning: 03/05/2015, Session counter: approx. 10 sessions. 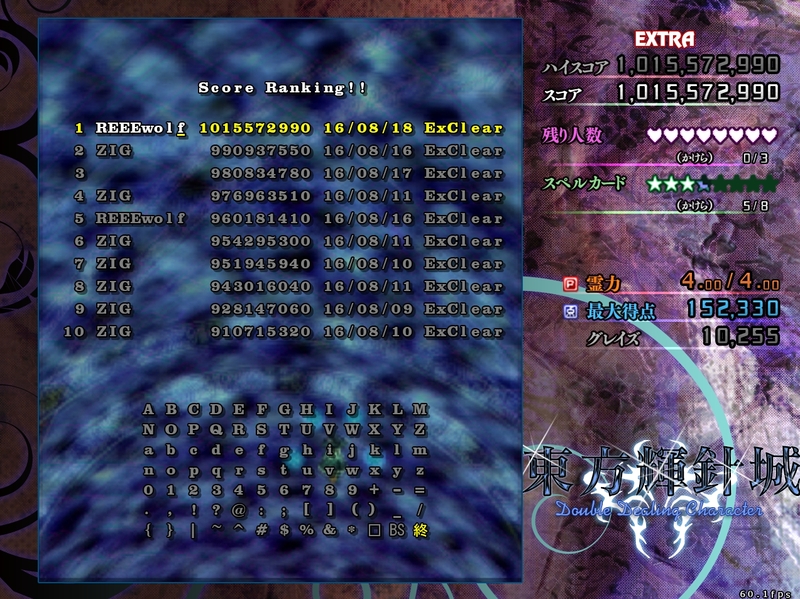 Normal: 1cc could beat 4 levels, completed with continues, actual high score: 115.6M (Reimu). Beginning: 08/02/2015, Session counter: approx. 77 sessions. Normal: 1cc Cleared with Youmu/Yuyuko, 7 lives and score of 613047040 (613.0M) (02/05/2015), Reimu/Yukari (7 lives); actual high score: 790049000 (790.4M) (Reimu/Yukari). 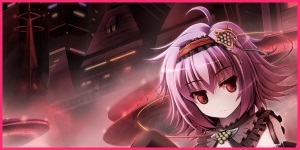 Hard: 1cc could beat 4 levels, actual high score: 354784170 (354.7M) (Reimu/Yukari). 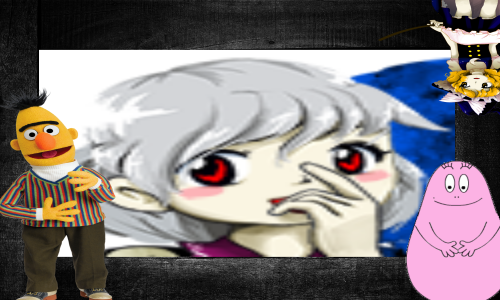 Lunatic: 1cc could beat 2 levels, actual high score: 97119490 (Reimu/Yukari). Extra: 5/10, actual high score: 520763130 (520.7M). Beginning: 07/09/2015, Session counter: 14 sessions. Normal: 1cc with Aya (too easy? ), 2 lives, score: 31152090 (31.15M), actual high score: 31152090 (31.15M). Hard: tried, but no certain data. Lunatic: tried, no certain data. Normal: 1cc could beat 5 levels, even with continues can't complete lv. 6, actual high score: 124.9M. Lunatic: funny, still can't complete level 1, but it's not so difficult to capture Shizuha's spell (i didn't succeed yet). Also Karisa is right. Maybe you'll enjoy it. Hey all. 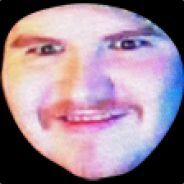 Anyone still remember me? I remember you. There are only so many people who play Phantasmagoria Trues, and I keep track as I see them. Thanks to all of the people welcoming me back! It feels nice. Hee, thanks! I gave it a quick spin and made it to Nue's red UFO card on my first try. Can probably do better, I made a couple of bad mistakes. Typical first-try "didn't see that coming" stuff. I don't know if I have the drive to try it seriously though; UFO in general has never really appealed to me, and to be honest I've never actually learned the Extra stage like I have in most other games. All I really have there is just a basic clear of the stage (and an Undefined Darkness timeout, but that was forever ago). As for Legacy of Lunatic Kingdom: be prepared for stage 5, no matter which mode you choose. That's all I can say now. Also, IN Hard 1cc, FinalA, Reimu&Yukari! That was actually surprisingly easy, nailed it after 4 consecutive attempts. I finally beat LoLK with Sanae, on Normal. It was.. surprisingly easy, after I decided not to restart a million times because of stupid mistakes in stage 3. Had two lives still at the end! I've 1cc'ed all Windows on normal difficulty and cleared every extra except GFW and LoLK. I've also 1cc'ed MoF, SA and LoLK hard. Also, on normal, I did this with nearly every single shot type in each game. I think the only ones I have missing are DDC SakuyaB and LoLK Reimu + Marisa, none of which I look forward to doing. For side games, I did all scenes in the first 8 levels of Double Spoiler, and 62 out of 75 scenes no-item cleared in ISC. I have yet to play StB. I still need to complete all 6 routes in GFW. Only did 1/6 so far. I'm far too lazy to complete the rest.